Has the Society for Neuroscience lost its way? 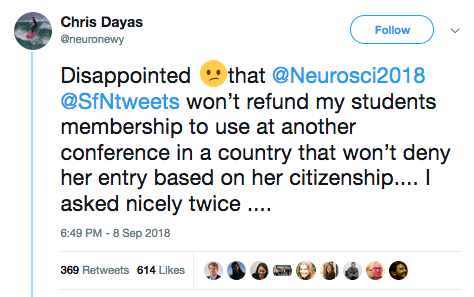 The tl;dr version: The Society for Neuroscience (SfN) makes humongous amounts of money from its journal and meetings, but spends very little on helping its members, while treating overseas researchers with indifference bordering on disdain. I first became concerned about the Society for Neuroscience back in 2010 when I submitted a paper to the Journal of Neuroscience. The instructions to authors explained that there was a submission fee (at the time about $50). Although I 'd never come across such a practice before, I reckoned it was not a large sum, and so went ahead. The Instructions for Authors explained that there was a veto on citation of unpublished work. I wanted to cite a paper of mine that had been ‘accepted in principle’ but needed minor changes, and I explained this in my cover letter. Nevertheless, the paper was desk-rejected because of this violation. A week later, after the other paper was accepted, I updated the manuscript and resubmitted it, but was told that I had to pay another submission fee. I got pretty grumbly at this point, but given that we'd spent a lot of time formatting the paper for J Neuroscience, I continued with the process. We had an awful editor (the Automaton described here), but excellent reviewers, and the paper was ultimately accepted. But then we were confronted with the publication fee and charges for using colour figures. These were substantial – I can’t remember the details but it was so much that it turned out cheaper for all the authors to join the SfN, which made us eligible for reduced rates on publication fees. So for one year I became a member of the society. The journal’s current policy on fees can be found here. Basically, the submission fee is now $140, but this is waived if first and last authors are SfN members (at cost of $200 per annum for full members, going down to $150 for postdocs and $70 for postgrads). The publication fee is $1,260 (for members) and $1,890 for non-members, with an extra $2,965 if you want the paper to be made open access. There are some reductions for those working in resource-restricted countries, but the sums involved are still high enough to act as a deterrent. 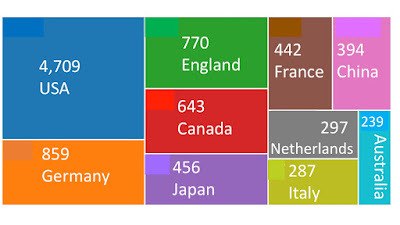 I used Web of Science to look at country of origin for Journal of Neuroscience papers since 2014, and there’s no sign that those from resource-restricted countries are taking advantage of the magnanimous offer to reduce publication fees by up to 50%. The justification given for these fees is that ‘The submission fee covers a portion of the costs associated with peer review’, with the implication that the society is subsidising the other portion of the costs. Yet, when we look at their financial statements (download pdf here), they tell a rather different story. As we can see in the table on p 4, in 2017 the expenses associated with scientific publications came to $4.84 million, whereas the income from this source was $7.09 million. But maybe the society uses journal income to subsidise other activities that benefit its nearly 36,000 members? That’s a common model in societies I’m involved in. But, no, the same financial report shows that the cost of the annual SfN meeting in 2017 was $9.5 million, but the income was $14.8 million. If we add in other sources of income, such as membership dues, we can start to understand how it is that the net assets of the society increased from $46.6 million in 2016 to $58.7 million in 2017. 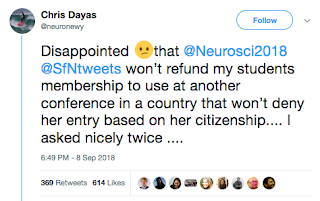 This attracted a fair bit of adverse publicity for SfN, and just over a week later Chris heard back from the Executive Director of SfN who had explained that whereas they could refund registration fees for those who could not attend, they were not willing refund on membership fees. No doubt for an organisation that is sitting on long-term investments of $71.2 million (see table below), the $70 membership fee for a student is chicken feed. But I suspect it doesn’t feel like that to the student, who has probably also incurred costs for submitting an unsuccessful visa application. There appears to be a mismatch between the lofty ideals described in SfN's mission statement and their behaviour. They seem to have lost their way: instead of being an organisation that exists to promote neuroscience and help their members, the members are rather regarded as nothing but a source of income, which is then stashed away in investments. It’s interesting to see that under Desired Outcomes, the Financial Reserve Strategy section of the mission statement has: ‘Strive to achieve end of year financial results that generate net revenues between $500,000 and $1 million in annual net operating surplus.’ That is reasonable and prudent for a large organisation with employees and property. But SfN is not achieving that goal: they are making considerably more money than their own mission statement recommends. That money could be put to good use. 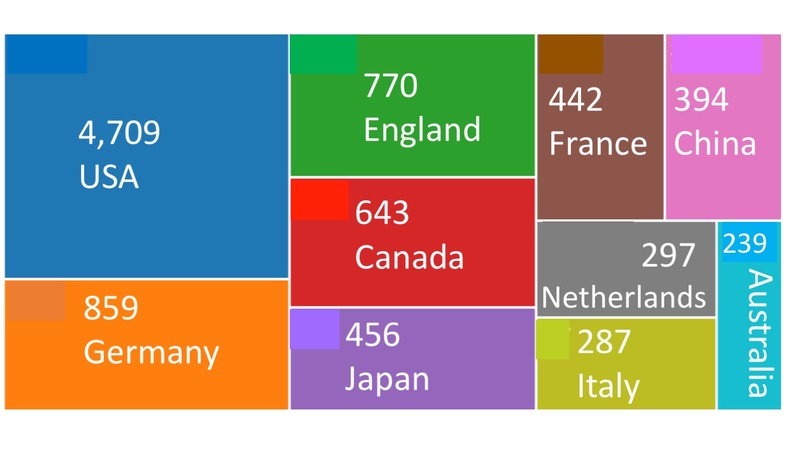 In particular, given SfN’s stated claim of wanting to support neuroscience globally, they could offer grants for scientists in resource-poor countries to buy equipment, pay for research assistants or attend meetings. Quite small sums could be transformational in such a context. As far as I can see, SfN currently offers a few awards, but some of these are paid for by external donations, and, in relation to their huge reserves, the sums are paltry. My impression is that other, much smaller, societies do far more with limited funds than SfN does with its bloated income. Maybe I’m missing something. I’m no longer a member of SfN, so it’s hard to judge. Are there SfN members out there who think the society does a good job for its membership? This post was prompted by Tom Hartley, who asked if I would be willing to feature an interview with Alan Baddeley on my blog. This was excellent timing, as I'd just received a copy of Working Memories from Alan, and had planned to take it on holiday with me. It proved to be a fascinating read. Tom's interview, which you can find here, gives a taster of the content. The book was of particular interest to me, as Alan played a big role in my career by appointing me to a post I held at the MRC Applied Psychology Unit (APU) from 1991 to 1998, and so I'm familiar with many of the characters and the ideas that he talks about in the book. His work covered a huge range of topics and collaborations, and the book, written at the age of 84, works both as a history of cognitive psychology and as a scientific autobiography. Younger readers may be encouraged to hear that Alan's early attempts at a career were not very successful, and his career took off only after a harrowing period as a hospital porter and a schoolteacher, followed by a post at the Burden Neurological Institute, studying the effects of alcohol, where his funds were abruptly cut off because of a dispute between his boss and another senior figure. He was relieved to be offered a place at the MRC Applied Psychology Unit (APU) in Cambridge, eventually doing a doctorate there under the supervision of Conrad (whose life I wrote about here), experimenting on memory skills in sailors and postmen. I had known that Alan's work covered a wide range of areas, but was still surprised to find just how broad his interests were. In particular, I was aware he had done work on memory in divers, but had thought that was just a minor aspect of his interests. That was quite wrong: this was Alan's main research interest over a period of years, where he did a series of studies to determine how far factors like cold, anxiety and air quality during deep dives affected reasoning and memory: questions of considerable interest to the Royal Navy among others. 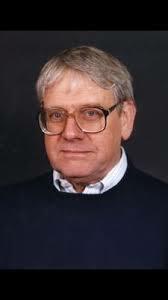 After periods working at the Universities of Sussex and Stirling, Alan was appointed in 1974 as Director of the MRC APU, where he had a long and distinguished career until his formal retirement in 1995. Under his direction, the Unit flourished, pursuing a much wider range of research, with strong external links. Alan enjoyed working with others, and had collaborations around the world. After leaving Cambridge, he took up a research chair at the University of Bristol, before settling at the University of York, where he is currently based. I was particularly interested in Alan's thoughts on applied versus theoretical research. The original APU was a kind of institution that I think no longer exists: the staff were expected to apply their research skills to address questions that outside agencies, especially government, were concerned with. The earliest work was focused on topics of importance during wartime: e.g., how could vigilance be maintained by radar operators, who had the tedious task of monitoring a screen for rare but important events. Subsequently, unit staff were concerned with issues affecting efficiency of government operations during peacetime: how could postcodes be designed to be memorable? Was it safe to use a mobile phone while driving? Did lead affect children's cognitive development? These days, applied problems are often seen as relatively pedestrian, but it is clear that if you take highly intelligent researchers with good experimental skills and pose them this kind of challenge, the work that ensues will not only answer the question, but may also lead to broader theoretical insights. Although Alan's research included some work with neurological patients, he would definitely call himself a cognitive psychologist, and not a neuroscientist. He notes that his initial enthusiasm for functional brain imaging died down after finding that effects of interest were seldom clearcut and often failed to replicate. His own experimental approaches to evaluate aspects of memory and cognition seemed to throw more light than neuroimaging on deficits experienced by patients. The book is strongly recommended for anyone interested in the history of psychology. As with all of Alan's writing, it is immensely readable because of his practice of writing books by dictation as he goes on long country walks: this makes for a direct and engaging style. His reflections on the 'cognitive revolution' and its impact on psychology are highly relevant for today's psychologists. As Alan says in the interview "... It's important to know where our ideas come from. It's all too tempting to think that whatever happened in the last two or three years is the cutting edge and that's all you need to know. In fact, it's probably the crest of a breaking wave and what you need to know is where that wave came from."